What Is the Difference between a Collection and a Source? What Should Be the Size of a Collection? What Are the Possible Statuses of a Source? What Is the Difference between Save and Save and Start? What Should Be the Size of a Source? What Are the Source Properties? What Information Is Displayed in the Status Page? Before performing a query in the search interface, the index must be populated; therefore, the sources configured must be crawled. Because this process requires considerable CPU resources, this operation is scheduled to be automatically executed at 12 AM. You can however index one or more sources manually at any time. On the Coveo server, access the Administration Tool (see Opening the Administration Tool). In the Administration Tool, select Index > Sources and Collections. Select the check box for one or more collections that you want to index. 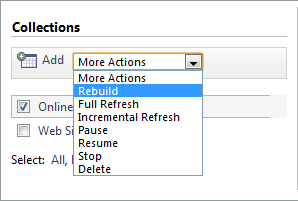 In the More Actions drop-down list, select Rebuild. Select the check box for one or more sources that you want to index.